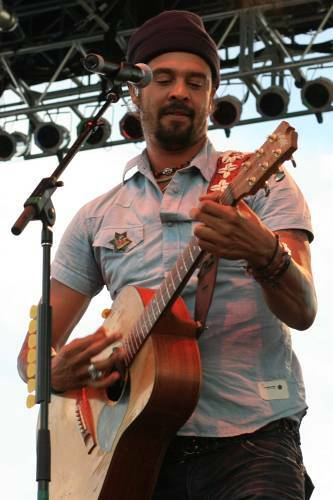 The Rex Foundation is pleased to award the 2010 Ralph J. Gleason Award to Michael Franti. The $10,000 award is in memory of music journalist Ralph J. Gleason, a major figure in the advancement of music in America in the 1960s, including his being a long-time contributor to the San Francisco Chronicle, a founding editor of Rolling Stone Magazine and cofounder of the Monterey Jazz Festival. Mr. Gleason's openness to new music and ideas transcended differences between generations and styles. A Bay Area native, Michael Franti has been bringing our world exceptionally powerful, deeply felt music under a variety of names and in a wide range of genres for twenty years, from the intense punk rock of the Beatnigs, to the deeply political rap he made with the Disposable Heroes of Hiphoprisy, to his joyful and meaningful modern soul music with Spearhead, and now as Michael Franti & Spearhead. As Rosalie Howarth, Rex Board member and KFOG Show Host and Director of Special Programming, explains, "The Ralph J. Gleason award honors people who strive to bring fresh cultural ideas and music to the mainstream public. Through his positive, inclusive lyrics, and his personal visits to strife-ridden areas such as Iraq, Palestine and Israel, Michael has seen first-hand the effects of war. He has taken his music to the people on the street, and absorbed their cultural influences in return, bringing them back to share at his annual free 'Power to the Peaceful' festival in Golden Gate Park, and on the silver screen with his powerful documentary 'I Know I'm Not Alone'. Michael's unfailing optimism toward the human spirit and his tireless effort to spread peace and multiculturalism make him a world citizen and highly deserving recipient of the Rex Foundation Ralph Gleason Award." Franti states, "It's a huge honor to be recognized by the Rex Foundation for this award. Being a fan of the Grateful Dead I know the diversity of its community and share the vision of creating togetherness and acceptance through music. My musical message is much the same: If we can bring people together through the one-ness of music, it gives a starting point to address the larger needs of our communities and the world. I am excited that music plays a greater role in the lives of all of us than ever before and the encouragement of this award reaffirms my faith that my journey has been worth every precious step!" Furthering what the Grateful Dead started 27 years ago, the Rex Foundation, a non-profit charitable organization, endeavors to fund grassroots programs that are often under the radar of larger funding entities, yet work in bold, innovative ways to carry out essential work toward a healthy environment, promotion of the arts, protection of indigenous cultures, assisting others less fortunate, building strong communities, and educating children and adults. The Rex Foundation has distributed $8.6 million in grants to over 1,000 programs across the U.S. and internationally, while also carrying out fundraising initiatives that foster creativity and positive community connections. Visit www.rexfoundation.org for a complete list of grantees and information about current initiatives.